Home > Magazine Deals > Magazines.com: 51% Cashback! 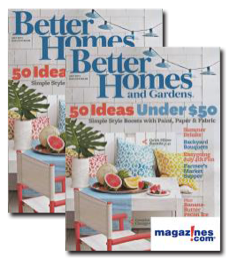 Today only, Ebates is offering double cash back (51%) for Magazines.com. They run this every couple of months, and it makes for awesome prices on a lot of magazines that are hard to find deals on. What makes this twice as good is Magazines.com also has a Christmas in July Sale running. You’ll get 3 extra months for a penny. If you are new to Ebates you’ll also get a $5 bonus for signing up. Remember with cash back deals you will pay the full price at checkout and then see your cash back in your Ebates account within 2-4 days.